As VR continues to become a part of daily lives, London-based VR developer Pebble Studios thought it was high time the younger generation had a chance to show what they'd like in an immersive virtual reality game. So the studio worked with a group of seven and eight-year-old children from Grange Primary School, West London and tasked them with creating a set of exciting characters and stories to tell. 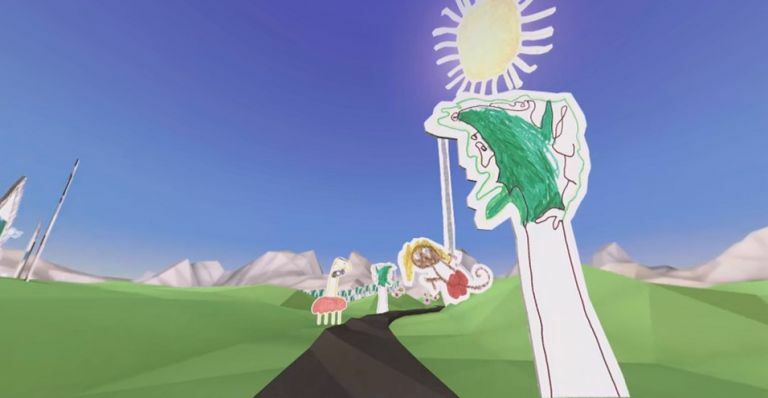 The studio then went away and turned the kids' drawings into their very own VR world! The group drew colourful artworks of their imaginative worlds and the creatures in it, impressing the VR production company with their descriptions of ‘candy land’ - home to giraffes in bow-ties and a multi-coloured disco-loving T-Rex! Two weeks later, the studio had brought their sketches to life in the video you can see below (use it with your Google Cardboard headset for the proper experience). Are you looking for a set of headphones that look nice, sound decent and cost you next to nothing to buy? Well, the planets have aligned in your favour thanks to the release of the new Brooklyn Headphones from the minds at KitSound. For only £10, the Brooklyn Headphones are a set of over-ear cups that cost less than most cheap in-ear headphones from your local supermarket. The headphones are lightweight and foldable, making them perfect for stashing away on a trip and a handy call-handling feature enables you to take calls on your smartphone with the touch of a button. The Brooklyn Headphones from KitSound are due for release in the UK shortly. You can also pre-order a pair from Amazon today. British audio specialist Bowers & Wilkins will be using some of its slick portolio of speakers to bring seminal artist Wolfgang Tillmans’ self-named exhibition at the Tate Modern to life via an immersive ‘Playback Room’ experience. Kitted out with 800 D3 speakers, the flagship model of the 800 Series Diamond range, the room will engage visitors with high fidelity sound in a celebration of Tillmans’ multi-discipline approach. The Bowers & Wilkins/Wolfgang Tillmans event isn't the only exhibition in the UK mashing up sound and art - there's currently a You Say You Want a Revolution? Records and Rebels 1966-1970 exhibition on at the Victoria and Albert Museum that's using Sennheiser headphones to bring some classic '60s tunes to life. Wolfgang Tillmans - 2017 will be running at the Tate Modern until 11 June, 2017. For more info, head on over to the Tate Modern's official site. How good is your swing? Anyone who thinks they have a big swing can head down to one of over 100 American Golf stores nationwide between the 17 and 20 February and participate by taking six computer-measured shots. Their longest distance is then submitted as an entry and the top 2 winners from each store will go on to regional finals and then potentially national and even on to the World Championships.